Like a mini Coriandre (1973), rosy and herby Infini by Caron is an edgy floral aldehyde with a distinctly '70s kind of sophistication. It starts out with a strong coriander note, which creates an interesting dry counterpoint to the juicy peach, sweet neroli, and rich rose that bloom as the fragrance evolves into its floral heart. Infini then dries down to a wonderful base of woody sandalwood and vetiver, with tonka, musk, ambrein (ambergris), and civet, the animalic notes adding subtle sexiness and warmth. Hours after I’ve applied it, Infini, befitting its name, seems to go on forever, echoing the faintest rose and coriander veiled by warm base notes. I was looking at an early 1970s Vogue with a friend, and she remarked that the young models looked like women and not teenage girls like they do today. Just think of the supermodels then: Gia Carangi, Karen Graham, Beverly Johnson, and Lisa Taylor (shown below). They were in their twenties, and their faces looked adult rather than adolescent — knowing, womanly, even sexually intimidating. Perfumes from the 1970s share that unapologetic sophistication. They weren’t afraid of being a little difficult and complex. After all, teens already had their own scents like Love's Baby Soft and Blue Jeans by Shulton. This division that once existed between women and girls and that seems all but blurred now****, makes me think of an interview I heard on NPR with Jonathan Franzen. He was talking about his new book Freedom, and he said it was in part a lamentation over the loss of the distinction between adults and children. I’d say there’s a similar problem going on in the world of fashion, beauty, and fragrance. With women freezing and filling their faces to resemble the teens they’ll never look like again, it’s no wonder they also want to smell “young." Apparently, "woman" is a dirty word. It’s funny, perhaps it’s because I was a kid in the late seventies and early eighties, but I never wanted to smell (or look) young. I loved my mother’s jackets, silk blouses, and chypre perfumes, her red, glossy lips and dark eye shadow. Young just never seemed that interesting to me. I’ve been visiting my mother, whose taste in perfume has sadly changed with the times. (Well, I find it sad.) No more Femme, Magie Noire, or Diva for her; she likes the easier, lighter perfumes now. Today, I was wearing Infini around the house to get a sense of it. * The perfume notes and date (1972) I've listed are from my Haarman & Reimer guide, which are at odds with the notes and dates that Vetivresse and Fragrantica list. I'm going with H&R because their notes ring truer to the perfume I have; I can actually smell the coriander, lily of the valley, etc. ** There was an Ernst Daltroff Infini from 1912. No idea what that smells like. *** Infini's cool, space-age looking bottle in the shape of an infinity sign was designed by Serge Mansau. **** Witness 47-year-old Demi Moore tweeting pictures of herself in a bikini like a Facebook teen. I know the feeling of wanting to share your find and then getting dissed- The end of your story made me laugh really hard! I was diggin' it like crazy.I was struck by the sultriness, the naughtiness of dark plum and leather, it was almost too much yet I loved it. I played coy but knew they would notice sooner or later. "Mama!??? What are you wearing tonite??" they asked in earnest but I should have recognized the teasing in their voices. "Do you guys like it, doesn't it blow your mind? Do you wanna try some? What does it smell like on me?" I was eager to hear their opinions , share the notes and fume', the history. "Mama...you smell like a barnyard!" And then they all busted up hootin' and hollerin'. I just continued to huff my delicous wrists and hands while they shook my bed in laughter. Tamara*J — I love that story! I think so many of us who love the old stuff have been dissed for our loves, but maybe part of what makes us love vintage so much is the outsider status of it all: "You guys JUST DON'T GET IT!" That's pretty sophisticated for your kids to describe Femme as "barnyard," though! Maybe there's hope after all? Barbara, do you think your mother's attitude to perfume might have developed because as she has aged she has actually grown more confident and relaxed? I only say this because that has been my attitude to dress, and not just because the dress code in the workplace has relaxed a bit in 20 years. I used to dress quite conservatively for the office because it was safe, and I was young and shy. With experience my confidence has grown and I've become relaxed enough to develop my own style which is actually 'younger' than I used to wear. I don't think twice now about wearing a denim jacket to work, as long as it's matched with relatively formal trousers, shoes with maybe a bit of a heel, some elegant earrings, and classic perfume. Lovely review of Infini. I love those models! Carole Bouquet, for Chanel, was another (tho' that was the 80s). I don't know about sophisticated but the babes are well aware of my hobby(obsession!!) 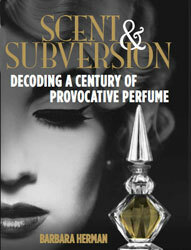 with perfume and we do talk about it alot, usually in the scenario I wrote about. It's very satisfying to have something to share with them that I love that they will always remember me by and yes they will appreciate all of it someday! We live in a small antique town - Snohomish,Wa. with lots of horses, cows, llamas, miniature donkeys in the country, we are all used to the fragrant aromas of rain-drenched forests ,fields,stinky barnyard,manure and hay. Keep up the great reviews, I love them! Please do Givenchy L'Interdit and Carven's Robe d Un Soir someday. I have a small mini bottle due to my fascination with the green florals of the 60's/70's. I think your notes ring true. It goes on young and green and pure. Then there are roses and lily of the valley. And then you notice wisps of leather and civet..hinting at a wild heart. It's not a night time perfume; the effect is chic and sophisticated. Reminds me of those DV wrap dresses. me: thinking/wearing.) That’s why I wanted to add that I thought it was sad, but that I’m sure it’s something entirely else for her. After all, I’m coming at perfume from a kind of nostalgic, collector’s point of view. Cheryl, interesting that you describe Infini as young! I hear you, though; lily of the valley signifies that for me, too. It smells so sophisticated to me, but who says young can’t be sophisticated? Perhaps I am so used to the fruity crap that passes for “young” these days. I also like the idea of this as the perfume version of a DvF wrap dress…The 70s are back, according to NY fashion week. Maybe we should all celebrate by wearing 70s perfumes? Hi again, I bought a mini of Infini (ha! a 'mini Infini') from the The Miniature Perfume Shoppe and have been delighted with it. My first impression that it has a definite retro feel. It evokes the 1970s for me - perhaps I knew someone who wore it. Or perhaps it's reminding me of a similar fragrance I knew as a child. Anyway, I love its balance between sweet and spicy, cool and warm. A friendly fragrance, I think, easy to wear. It has juiciness but there is still enough structure to keep it from collapsing. I have a flare up of eczema at the moment so have to be careful about perfume on my skin. I wore the Infini on a cotton ball in my bra (a great old trick that) and although it's an EDT, it lasted most of the day. My other MPS purchase was L'Interdit of uncertain age, but pre-2002 re-release for sure. It opens beautifully but dries down to something a little plain and powdery. Reminds me of Chanel No 5 EDC. So glad you liked Infini, Anne! It is easy to wear, and I love the bottle. I recently was in an antique shop and the owner was an older lady of around 65-70. We got to talking about perfume, because that's what I was looking for there, and it was a bit surreal because she was naming off all her favorite perfumes, sure that I'd be enthusiastic about them...but they were all newer perfumes: Cashmere Mist, Michael Kors, Beyond Paradise. And I was naming off MY favorite perfumes (which were of her generation) and she wasn't the least bit interested. It was strange, like our "perfume roles" had been reversed. Finally she admitted that she adored Magie Noire, and we got into a big discussion about that. Just got 1/4 oz of the parfum on ebay for a song! Felt a little bad when the lucite top cracked, tho it seals just fine. HMFS, this stuff is sublime! Agree 100% with the H&R notes. This is another in the pantheon of they-don't-make-them-like-they-used-to womanly aledhydes, a sister to Chamade and Miss Dior, a bit more distantly related to two other favorites, Miss Balmain, and My Sin. I know of no contemporary fragrance that socks it to me like these greats.